Great recipes appropriate for children, and doable in about an hour in most cases. This is the most flavorful vegetarian soup I think I've ever made! The beans made it... mealy. Nice contrast of warm lentils on cool lettuce, light but filling. Fresh dill would have been better, but dried worked reasonably well. Could have used a bit more lemon juice in the vinaigrette to give it some sparkle. I didn't have coconut milk on hand, so I sauteed the leek in coconut oil and substituted soy milk instead of coconut milk. Very tasty. Even my 15 month old ate it. One of my favorite recipes EVER. Can make it with cooked rice, heating everything together. Also make it with scallions instead of leeks. We quite liked this as a (relatively) quick, healthy, and filling weeknight meal for spring. The flavor of the curry powder really comes through. I made a few changes: used coconut oil for the sautéing, doubled the tofu, used brown rice instead of white, cut back on the rice (probably to three cups), used 1 tbsp of fish sauce in place of one of the tbsp of soy sauce, and added some baby spinach we had around. I also doubled the coconut milk, which I'm not sure was necessary and made it a bit soupy at first (though the liquid absorbed); even as written, it's not really fried rice in the traditional sense. Could use some crunch--I'd toss in some chopped dry-roasted peanuts if I had them around. Good with Sriracha. We really liked this, it is a nice change from the more standard versions I usually make. The coconut milk/lime/curry flavors are quite nice. I added some sautéed mushrooms (needed to use them up) which worked very well. Also added baby bok choy, and diced red pepper. As it turned out, the leftovers made an excellent lunch the next day, flavors still bright. I do recommend this one, and will definitely repeat. Good enough, but the kids were NOT fans. Perfect use for leftover chard stems since most other recipes call for just the leaves.Very savory dish. Very pleasant dish, mildly seasoned just from the vegetables used, salt and pepper, and whatever vegetable stock you use. I threw in some white wine that needed to be used. Husband ate it over leftover cheesy pasta & loved it, while I ate it alone & enjoyed it, but, as mentioned before, it's very mild tasting. Might try amping up the flavor quotient next time. Added carmelized onions and sauteed zuccchini and cherry tomatoes instead of grilling. Makes at least SIX full servings, more if a side. Light and tasty salad. Had to triple the recipe for a crowd, and it took *forever* to reduce 3 cups of orange juice to a syrup (45 minutes!). Fortunately I started cooking early. A nice salad to accompany a simple pasta dish. The raspberry vinaigrette was very fresh tasting, not overly sweet like the usual bottled variety, but since it was so thick, when mixed with the salad it was not as visually pleasing. I found it challenging to thoroughly mix the berries & other ingredients to a smooth consistency using a fork as suggest. Might try my stick blender next time. Good, but pan-roasting the garlic did NOT work for me. As a result, there wasn't enough garlic in the dish. This tasted and looked wonderful. My husband was like "where has this stuff been all my life?" It was pretty easy too. Using convection oven cuts down the vegetable roasting time to 20-25 minutes. Used Dufour puff pastry. Fresh thyme is not very necessary. Dry thyme will do (almost) just as well. My vegetables got too mushy, so I folded the pastry over the veggies, and they looked pretty. Gorgeous and tastes great either warm or at room temperature. The rosemary-black pepper crust is pretty special. Very tasty and flavorful for such a simple soup! I used chicken broth instead of water, doubled the rosemary and bay leaves, and added a cheddar rind rather than parmesan because that's what I had. Did serve it with coarsely grated Parmesan at the table. Served it at a pot luck and everyone raved about it. My husband is not a fan of curry, so this was a hard sell. I thought it was a bit bland--could have used more curry seasoning, & more coconut milk; for my taste, I think regular coconut milk rather than the light type recommended, would rev this up a bit. More spinach would have been nice as well. For the omnivore, this would be an easy dish in which to add some cooked chicken, or even shrimp. Good, and interesting use of the dried cherries, but it was a little bland. Maybe more garlic next time? This was REALLY good. Had some really fresh shell beans, followed recipe, but substituted chicken broth for for vegetable broth and used fresh basil instead of tarragon (that is what I had). Beans were creamy and sauted shallots really gave a nice contrast in flavor. Loved it. Served with grilled chicken sausages. pg350-351. Great use of bok choy. Used 1 tea sesame oil 1Tbl canola mix in lieu of peanut oil on noodles. Added 1/4 cup cubed pancetta before bokchoy for smokiness. Had some trouble with burning the noodle cake (needs no more than 4 mins a side). Otherwise, a great dish. Hearty enough without any meat. Toast the bread crumbs and put on top rather than put under broiler- too easily burns! Yes! A way to make polenta without constant stirring & spattering hot cornmeal! This method of cooking on very low temp with a lid on the pot worked like a charm, and did indeed produce a nicely creamy polenta. This will be my way of making it from now on. If you are a Southerner, you probably will not like this. It wasn't the teaspoon of sugar that turned me off because in fact I often put a teaspoon in my trusted cornbread recipe. You don't taste it. The recipe calls for 1 1/4 cups flour and 3/4 cups cornmeal. I changed it to half and half as in my recipe. Some southerners use either all cornmeal or a larger proportion. The butter replaced the vegetable oil I usually use. The sour cream replaced buttermilk. The soda and baking powder seemed OK. He used a 400 degree oven for 25 minutes and I use a 425 oven for 25 minutes. I went with his oven temp and timing. The cornbread turned out with the consistency of a cake and no flavor as far as I was concerned. If I had used his flour to cornmeal ratio, it would have been worse. Maybe non-Southerners would like this but not if they are used to sweet cornbread. As a husband, father of two young children, cookbook author, magazine and book editor, and cast member of the highly successful PBS show America's Test Kitchen, who also does all the cooking for his family, Jack Bishop is an expert at making appealing vegetarian meals that work in real time. Cooking with seasonal produce, says Bishop, is the best way to bring a welcome variety to dinners. 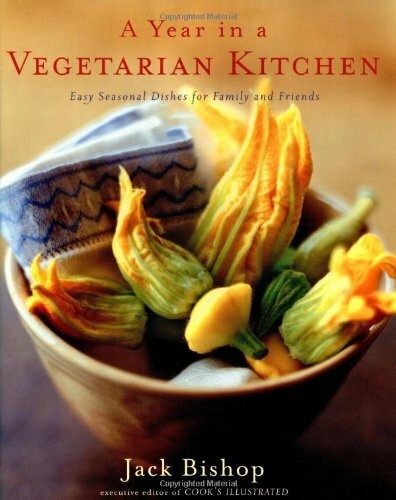 In A Year in a Vegetarian Kitchen, Bishop guides cooks through the seasons with 248 simple recipes that draw from many traditions. For spring, there's Garlicky Greens in Soft Corn Tacos; for summer, Penne with Pan-Roasted Garlic, Sautéed Cherry Tomatoes, and Basil; and for fall, Pizza with Caramelized Onions and Thyme. In winter, when farmers' markets are a distant memory in most parts of the country, dinners include Pan-Glazed Tofu with Thai Red Curry Sauce and Grilled Cheese Sandwiches with Mushrooms. In concise sidebars that accompany each recipe, Bishop gives readers the benefit of his ten years of experience at Cook's Illustrated, covering everything from choosing winter squash, preparing fennel, and making perfect fried rice to buying the best grater.